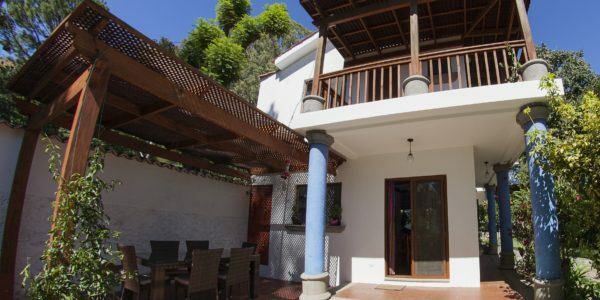 This beautiful, 2-bedroom home is nestled up above the road, on the outskirts of the colourful Mayan village of Santa Catarina Palopo, known for its brightly-painted houses. It boasts some of the best views of Lake Atitlan and its 3 volcanoes. Casa Luna Azul is available for a min. of 2 nights for up to 4 people in a double room and a single/twin room. It is the perfect tranquil retreat Get Away. The home is entered via a front terrace area with seating just perfect for sipping a morning coffee and watch Lake life, or a sunset cocktail perhaps. Just off here there is also a peaceful spot to read in a hammock. The house is open-plan with a dining area, living area with fireplace, a couple of steps then leads into the fully-equipped kitchen with everything a chef might need. It is an unusual design with lots of light and space and a large Master Bedroom up a couple more steps with floor to ceiling windows giving the bedroom a view to die for! It even boasts a large fireplace for the cooler nights in the dry season, or for a cosy effect during the rainy season. It also has a large closet alongside one wall. A second bedroom is just next door with a single bed and further mattress to sleep 2 further people in Twin beds. It is the perfect place for someone looking for peace and quiet on their own, a couple, of a family with one or two children. A large, new terrace has just been completed to the side of the house, opening up yet further amazing views of the Lake and providing another seating area. There is parking for two cars and a road-side entrance via a flight of steps up to the house. It is in a residential area, so peaceful and quiet, with no direct neighbours. The centre of Santa Catarina is a 10-min walk from the house. It is one of the 12 lake-side villages of the famous Lake Atitlan and is on the eastern side of the Lake just a short 20-minute drive by car from the commercial and transport hub of the Lake, Panajachel, better known as Pana. Sta Catarina is one of the most sought-after villages for rentals as it is road accessible and offers some of the best views across the Lake. It is a small Mayan village which is distinctive due to the beautiful blue coloured ‘traje’ (traditional costume) of the Mayan locals. This village is also one of the few in the country where many men still wear the traditional traje too. It has also recently hit the international news due to a fantastic idea of painting the local buildings in the bright colours that resemble the Mayan traje and traditional weavings. As more and more buildings become painted, the town is turning into a living, breathing Work of Art! All the brain child of a Guatemalan journalist, Harris Whitbeck, who was inspired by a similar project in a poor, urban area of Rio de Janiero in Brazil. Santa Catarina is a small, quiet, non-touristy village. As a result it is not geared towards tourists in that there are no bars, cafes or restaurants – these are all in Panajachel. Here you will also find the public docks for the public boats to other villages around the lake. Having a car is helpful, but not essential. There are pickups that pass by the house throughout the day that you can just hop on the back for a few Quetzales and they will take you either on to San Antonio Palopo, famous for its ceramics and small church, or into central Sta Catarina and on to Pana. Likewise in Pana you can also find tuk tuks that will bring you back to Santa Catarina. There is a very friendly dog, Toni, that lives on the property. If you do not like having a dog around the guardian, Martin, can take her in his house during your stay. Please just let us know. Martin works during the week days and he can help with getting drinking water and propane gas if needed. There is also a cleaner, Alysia, who can happily come in to clean the house and also do any laundry guests might want, for a small extra fee for her for her time. Come and see the colours and magic of Santa Catarina for yourself! Also available for longer rentals weeks or month. Please contact us for further information on this, availability and pricing.